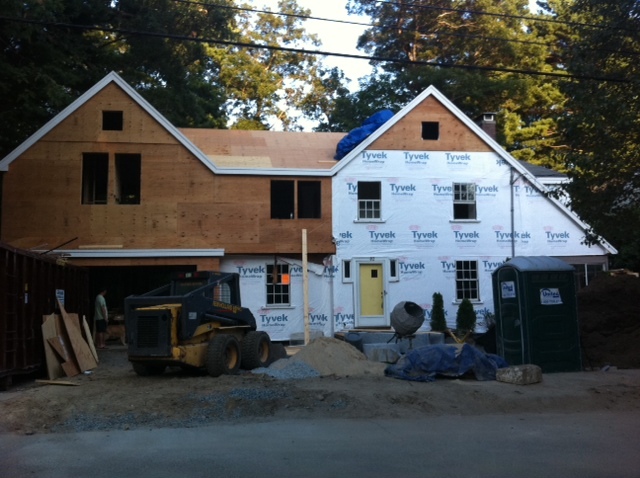 My husband took me on his real estate development project at 82 Day Street in Auburndale, a village in Newton. 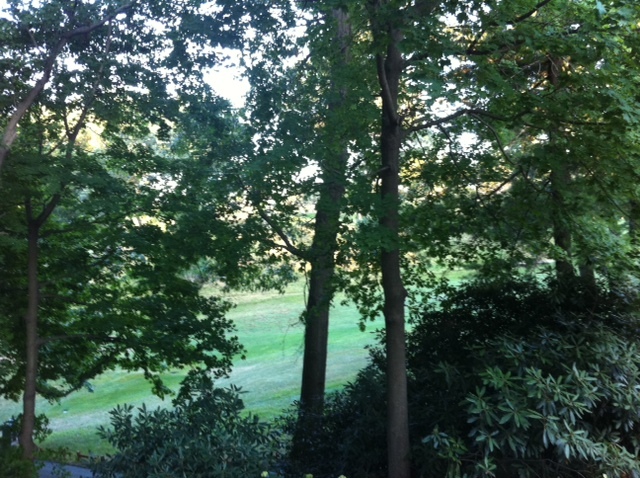 It has views of Brae Burn Country Club’s third hole! He fixed some issues with the house … namely the garage used to be basement level which meant it was inaccessible during the winter because the steep driveway was too slippery to back the car out. Now, there is a two car garage on the left on the first level so the homeowners can park their car inside during the winter and not have to remove snow and ice from their car. He’s also adding more square footage including a master suite, enlarging an existing bedroom, 2nd floor laundry, a new mudroom and full bath. The house will end up with 5 bedrooms with 3 full baths. The 100o foot basement will also be finished — playroom, office, mancave or all of the above?! I personally love nooks and crannies of an old house. This house will have a little nook at the top of the stairs that could be a small home office, or library with window seat reading area. If it were my house, I’d go for the library idea. One thing that I noticed is that the house has nice flow. My husband poo poos Feng Shui, the Chinese art of auspicious placement, but he has a natural knack for it as I’ve discovered after studying a pile of books to decide what is right and wrong. He, on the other hand, just seems to know and saying “it’s obvious.” The irony! And he’s not even Chinese! This is his last project in Newton if you want to see finishes. He is going to do the kitchen in the same white cabinet, black honed granite counters. And the flooring is going to be wide Brazilian Cherry hardwood! The dark wood should really pop against the light kitchen! I just saw the kitchen sink he picked out. Farmstead sink but made of stainless steel with apron drop. Honestly, white sinks require daily scrubbing with powder to get the black lines out. Stainless steel is much easier to keep clean. I like deep sinks to hide dirty dishes. New addition makes house more symmetrical. The new addition also makes the house more symmetrical. Architecture design by Peter Sachs. My husband added vaulted ceilings in parts of the new addition to make the house feel airy and spacious. New mudroom and full bath with dog bath area. 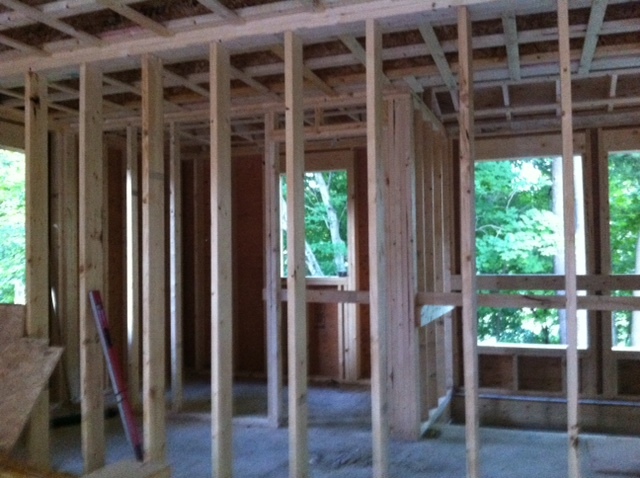 The new addition’s framing is complete. The left side is a mudroom as you come in off the garage and behind that is a full bathroom with doggy shower. My husband didn’t think that anyone would use a shower off the first floor if there are two full bathrooms upstairs but , as we have a dog who loves swampy water (Golden Retriever), we fully appreciate the idea of an indoor dog wash area. This is the view from the kitchen sink. Imagine looking at the view of Brae Burn’s 3rd fairway as you wash dishes. Warning: could be very distracting! The new master suite is above the garage and will have very high ceilings and lots of natural light from all these new windows. We are from California so we crave natural light in a house. My little son said that the closet is bigger than his room. I think this is actually true. 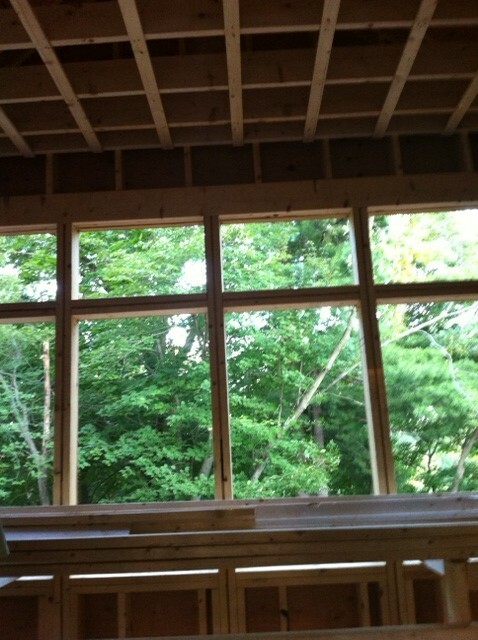 This house is slated to be complete by the end of September.